The De Bond Marine Formula helps to remove Sikaflex, polyurethane adhesives and sealants including cured and uncured 3M 5200 4200 and 4000 & Sika 291 adhesives. De Bond Marine Formula helps to remove Sikaflex, polyurethane adhesives and sealants including cured and uncured 3M 5200 4200 and 4000 & Sika 291 adhesives. 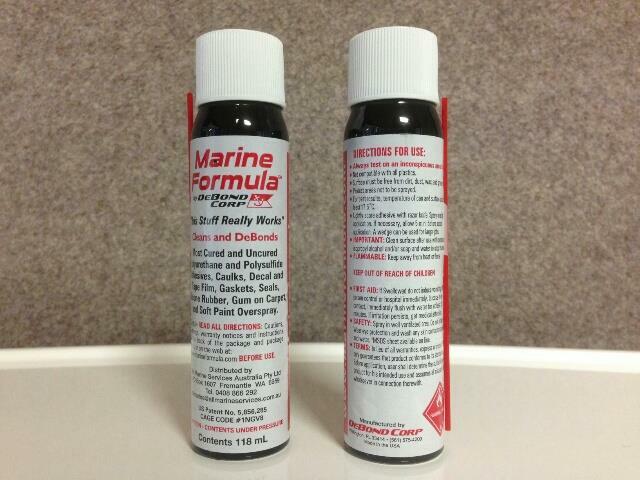 Marine Formula is the only Patented product, specifically designed to break the bonds of polyurethane & silicone adhesives. This handy product will take the headache out of replacing and resealing deck hardware, hatches and thru-hull fittings. DeBond Marine Formula also works extremely well at removing all masking tape, shrink wrap tape, duct tape adhesives, vinyl lettering and black rub marks. It will not harm fiberglass, any two part paint systems, or Plexiglas. Supplied in a 118ml aerosol spray can. Review : Awsome product breaking the bond and clean up on the hull.